APT, LLC is the only supplier who suggests atmospheric to high pressure (currently up to 7 bar or 105 psi) Inductively Coupled Plasma (ICP) torches also named as Radio Frequency (RF) with power in plasma from 30 kW to 500 kW for over 10,000 hours non-stop operation. Click HERE to see RF torch in operation. These devices could be the key elements of the most advanced waste processing, coal, sewage sludge, and biomass gasification, fuel reformation, plasma chemical, metallurgical, coating, heating, melting, cleaning, and other systems, enable synthesis of new materials, including isotopes, nano-powders, and nano-tubes, provide fuel flexibility to SOFC based systems. 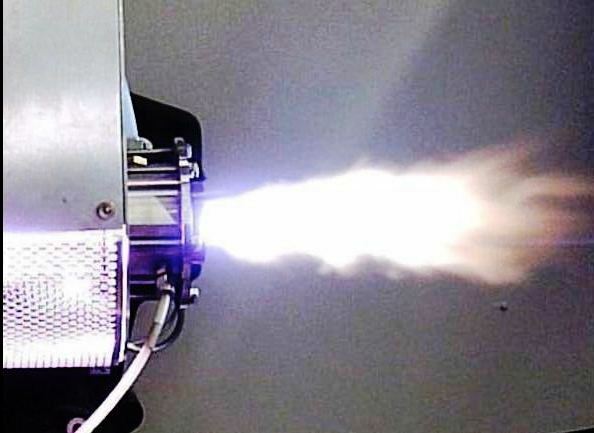 Patented high power RF torches with triple vortex plasma stabilization (US Patents 7,452,513 B2, 7,955,567 B2, and several patents pending) provide unique efficiency both thermal and electrical, generate pure plasma with temperature up to 12,000 C, output velocity from 20 m/s to 300 m/s, completely free of contamination from the electrodes erosion, and have almost endless lifetime. They could be tested at the load up to 600 kW and a number of feedstock gases as air, argon, nitrogen, oxygen, and different blends at the APT's brand new RF laboratory in Springfield, VA.
RF torches with remote discharge initiation can be combined with the nozzles, swirleres, and multi-stage downstream reverse vortex reactors for high effective plasma mixing with different reagents, including gases, liquids, and solids, and further "cold wall" operation. See photograph of a 500 kW multi-purpose atmospheric pressure torch with water cooled extension nozzle on the right. The first plasma systems powered by two types of power supplies - "INTEGRATED" and "MODULAR" became commercially available from January 2012. See the first sold and commissioned INTEGRATED type power supply with up to 30 kW in high pressure plasma (equivalent to 60 kW rated analogues) on the right photograph. It has dimensions 83" (H) x 30" (W) x 42" (D). Control system provides remote plasma initiation, multi-gas operation, frequency stabilization, real plasma power regulation, monitors and indicates critical parameters, allows operation modes programming, remote and computer controlled operation. Torch is connected to the power supply by a 3 m length cable for more operational flexibility. 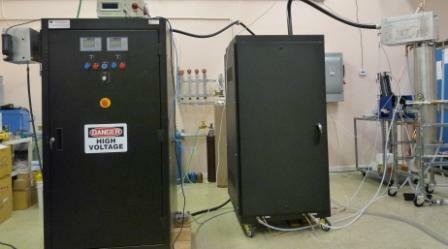 The MODULAR type power supply and commercially available system for contaminated liquids destruction, including sewage sludge, based on 50 kW torch coupled with a multi-stage reactor are shown below. During one of high pressure tests on 14th August, 2013 we have observed very interesting phenomenon of sustainable two-zone plasma existence. As one can see on the right photograph the upper zone is bright argon plasma and the lower green one is the nitrogen plasma. Now our new horizon is development of a solid state power supply with efficiency over 80% for at least 20,000 hours non-stop operation and advanced control system to perform ignition and reach any operation mode from yield to full-load by touching a screen. We are also working on the new torches to enable their operation on pure oxygen and water steam - the key gases for advanced gasification technologies. The first 50 kW O2 torch is currently ready for tests. On high demand is the elevated pressure system APT-100 for boron nitride nano-structures production. Its general view is provided below. The system includes a two-modular power supply with coaxial cable for more connection flexibility, capacitor bank with a 50 kW power output high-pressure torch mounted on top of a high pressure reactor. A three-gas control system supplies optionally. Click HERE to download detailed specification on all APT-100 modifications. More powerful RF system APT-200 for multiple industrial applications, including various powders treatment, industrial scale high-concentration NOx production, solar-grade silicon growth, nano materials synthesis, to name a few, is currently under development. Its advanced control system allows unmanned remote operation and integration into any customer plant management system. It will be commercially available for the US customers from June, 2019.